Around this time every year I seem to be thinking about buying a new computer. For us, for a family member, or just generally kicking around the state of the personal computer industry and what makes sense for consumer purchases. On one hand, most people are familiar with Microsoft's Windows operating system. On the other hand, people are having positive experiences with their iPhones and other Apple devices and they're wondering: Is the grass greener on the other side? In my experience it depends. But our experience as a family with a 21.5" iMac for the past year has been almost uniformly positive and I do recommend it as a family computing solution. The first thing that always drives me to consider a Mac is the simple and understandable manner in which they market their products. Each of their computers has a unique use model it's intended for, and once you decide which of their products you want they make it very easy to decide which specific model to get. Contrast this with the shopping experience at Dell.com which seems to get more complicated every time I look and it makes buying a Mac a pleasure. Consider the convenience of being able to get your computer serviced at nearby Apple Store locations. You can check wait times and set appointments online so you don't waste time waiting in line. The few times I've had products in for service they've either resolved the issue or replaced it on the spot. Even in situations where the device was significantly out of warranty. Macs may be a little more expensive than comparably equipped PCs but service like this makes it worth it. You've got to be careful when you wade into a conversation like this because for many it's nearly a religious debate. Have a problem with a Mac? You must be doing something wrong. Have a problem with a PC? You should be using a Mac instead. The smug somewhat-insecure confidence some Mac users exude is interesting to contrast on the mobile side of things. It feels to me like iPhone users have the quiet confidence PC users have: They're perfectly happy with the technology and they don't feel the need to argue about it. When deciding whether you're ready to take the leap from PC to Mac I think you should take stock of the programs you run on the machine on a daily basis. For me that was FireFox, an E-mail client, and TweetDeck. There has been some movement in this area in the past few years that make PC vs. Mac less relevant than it was in the past. First, E-mail services have increasingly adopted free open standards like IMAP (Google's Gmail provides free IMAP access) and Apple products have increasingly supported Microsoft Exchange. Checking E-mail web-based or not has become easier. Second, more applications have become web-based - like Facebook. There's no Facebook client for Windows or PC so interacting with Facebook is exactly the same experience on a Mac as it is on a PC. Further, programs like TweetDeck are written on Adobe Air so there's no lag between when new releases are available on Mac as they are on PC. These are changes in the last few years that make Macs a lot more like PCs. Third, Microsoft Office documents have become less ubiquitous - perhaps because different versions of Office seem to have trouble interacting with each other. That said they do make Office for Mac, and it's nice to have on occasion. On our first Mac we never bought it, but it does comes in handy. For personal use you can buy it for around $99 off Amazon: Microsoft Office for Mac Home and Student 2011 - Single License. Also, you may also want to check whether your employer has a Microsoft Home Use Program deal which could save you quite a bit. Fourth, I don't use the digital camera software that comes with cameras any more. On the PC I use Picasa to import and on the Mac I use iPhoto to import. On either you just stick the SD card into the computer and that's it. Therefore, there's no worrying about the Mac version of the camera software being inferior to the PC - because you probably won't use it anyway. With mobile devices everyone expects to be able to check on the things they care about from whatever kind of device they want to. This too has made Macs better equipped to interact with other systems - or maybe I as a user has become more adept at connecting our Mac to things I want to connect it to. For example - on our previous Mac I checked all of our E-mail via web pages. But when I saw how easy it was to connect my iPhone to all of the E-mail inboxes I want to keep up to date on I realized how easy it was to check E-mail with the free Mac Mail application. Another angle to consider mobile devices is in terms of how important it is to you that your family computer be a laptop? You get a lot more computing horsepower for the dollar if you buy a desktop computer. That's a true statement in the PC world and in the Mac world. The cheapest iMac is meaningfully more powerfully equipped than the cheapest MacBook so if you're going to have your computer sitting in the same spot most of the time an iMac is probably a better call than a MacBook. iPhones and iPads notoriously do not run Flash based videos and games. These applications run on the Mac but they've been a weak spot in my experience. On some of the entry-level Mac laptops, Flash applications run a little slowly compared to iMacs. To see the difference in performance go to your local Apple store and try playing this web-based gam on it. Notice whether the car speeds along without any lag or not. The first thing you'll notice when you try to play it on a Mac is that it won't work because you need to install an Adobe Shockwave plug-in. You'll need to get someone at the Apple store to log in with the administrative password to install Shockwave, and you'll need to restart FireFox after installing Shockwave. But if you can get through that you'll notice the game is speedy on the iMac and not so speedy on the MacBook Air or even the 13" MacBook Pro. And we all know computers tend to get slower as they get older so that's not a good place to start. The aesthetics of the all-in-one design feels two generations ahead of competing products from PC manufacturers. No wires. I finished setting up our new iMac Christmas morning in less than 10 minutes including unboxing, positioning, booting, establishing an Internet connection, and registering the machine. The only wire to connect is to power. Everything else is wireless including the keyboard, mouse, and Internet connection. The Internet connection is 802.11n so it has a strong signal from far reaches of the house whereas prior generations of wireless connections tended to be too flaky to rely on going wireless long-term. The machine multi-tasks brilliantly. Our entry-level $1,199 regularly has 3 users logged in with multiple applications open under each user and dozens of tabs open in each web browser. Our old iBook didn't tolerate this very well even with maxed out RAM. The iMac handles this brilliantly. Reliably goes to sleep and wakes up non-groggy. I wish I could say the same for my PC (or our kids for that matter). We rarely reboot our iMac and it beautifully and reliably switches between users and goes to sleep. I occasionally feel like the computer is trying to be too smart for its own good. Say for example you receive a photo as an attachment to an E-mail you're viewing in web-based mail. And say that E-mail is rotated 90 degrees. How do you reliably repair that rotation issue so that you can post that image in a blog entry? When you preview it you see a different rotation than if you save it to disk and view it in iPhoto. And where does your web browser put stuff when you "save" something? It frequently feels like things are a bit unnatural in this area. I'd probably get the hang of it if I spent the majority of my time on the machine but if I get confused with it I have a feeling others would be downright confounded by it so I think it's worth mentioning. The wireless keyboard and mouse are slick. But they sometimes go off in the weeds and fail to communicate with the computer. I don't know of any ways to "goose" the mouse to get it to reconnect with the machine but I wish I did because it occasionally forces a reboot especially when the kids have dropped it on the hardwood floor and the batteries have come flying out. In general, I think the Mac OS is better suited to a desktop computer with a large amount of usable desktop resolution than it is to a laptop. I say that because one of the first things you'll notice about a Mac coming from the PC world is that there's no "maximize" button on windows. The OS is set up to have a kind of drag and drop world where you interact between multiple applications rather that "right-click copy"/"right-click paste" or "click and hit the delete key". I mention this as a reason why I've been happier with Mac OS on the iMac desktop than on the iBook desktop. Last year we bought our iMac online on Black Friday. They're running the same promotion this year. Check it out here. What do you think? Is it time to switch to a Mac? Or are they quirky, over-priced, and not worth it? Great review Bob! 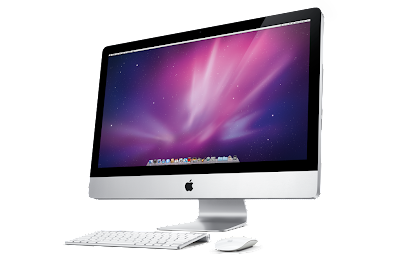 We have an iMac and a custom PC, as well as 2 PC based laptops in our home. We tend to migrate toward the PC based computers, but that could be due to overall familiarity with Windows. I recently had to have my iMac serviced and it was a pleasure to take it into the Mac store and have them address the problem immediately. No more heavily accented Level One service techs asking me on the phone if my computer is plugged in. Turns out one of the fans needed to be replaced in the Mac. This took about 3 days, so I didn't have a computer during that time, and as luck would have it, I desperately needed some photos off the computer. I guess what I am getting at is this: If it were a PC, Jason or Felipe would have taken it apart and replaced the fan for me. Because it is a Mac, the internal hardware (and access to it) seems to be somewhat mysterious, and that can be a downer for those who like to tinker around with their PCs. My favorite feature of the Mac is that it has a print to pdf feature integrated into their software. I use this feature regularly, and I haven't found a comparable one for the PC that doesn't cost hundreds of dollars. I also like the features of Preview, which makes it very easy to edit pdf documents (rearrange pages, for example), which is not available on the free version of Adobe. Love your reviews - keep it up! Oh, and I just got the new Windows Phone 7 (avoided the iPhone for a long time) and so far I love it! I've never been a fan of Apple too, but that changed when I got my own iMac. It's totally different from my PC and everything is kinda new to me. It's easy to navigate once you get used to it. Though I still have my good old reliable PC because I think both are great in their own ways. Also, it's good to have a back up in case one of them needs to be sent for repair.